Finland (Suomi in Finnish) is a country in Northern Europe and is a member state of the European Union. Finland is one of the Nordic countries and is also part of Fennoscandia. Finland is located between the 60th and 70th latitudes North. Its neighbours are Sweden to the west, Norway to the north, Russia to the east and Estonia to the south, beyond the sea called Gulf of Finland. Most of western and southern coast is on the shore of the Baltic Sea. The capital of Finland is Helsinki. The official currency of the country is the euro (EUR); before 2002 it was the markka, the Finnish mark (FIM). The president of Finland is Sauli Niinistö. 5.5 million people live in Finland. Finnish and Swedish both are the official languages of Finland; the most spoken languages is Finnish, mother tongue of about 90% of the population. Swedish is spoken by the Swedish speaking minority of Finland, called the Finnish Swedes, who make up 5% of the total population. Finland became independent of Russia on 6th December 1917. The most important cities and towns in Finland are Helsinki, Espoo, Tampere, Vantaa, Turku, Oulu, Lahti, Kuopio, Jyväskylä and Pori. Finland is a highly industrialised First World country. The most important Finnish industrial products are paper, and steel products such as machines and electronics. Nokia (the mobile company) is originally a company of Finland, named after a small town called Nokia. Finland has been top of the list of least corrupt countries on the Corruption Perceptions Index more times than any other country. Finns also study mandatory English and Swedish in school. Most Finns work either in services (that is: shops, banks, offices or businesses) or in factories. Finns often like saunas and nature. Many Finnish families have summer cottages, small houses where they go to relax on their summer holidays. The most important festivals that Finnish people celebrate are Midsummer and Christmas. The most popular sports in Finland are ice hockey, skiing, track and field and association football (soccer). Finns have also won events in swimming, motor sports and gymnastics. There is a group of a few thousand Samis (also called Lapps) in the most northern part of Finland, called Lapland. Most of the Samis live in Norway and Sweden. Many Sami people farm reindeers. Originally Samis were hunter-gatherers. In the past the Sami were nomads, but nowadays they live in regular houses. Very few people in Finland are from other countries. In 2016 about 4% of residents were born in another country. Most of Finland is covered by pine forest. The swan, which was considered holy long ago, is the national bird of Finland. Wood is the most important natural resource of Finland. It is estimated that up to one-third of all wood resources of the European Union are in Finland. The national animal of Finland is the brown bear. The largest animal is the elk, a type of moose, which is a member of the deer family. There are hundreds of rivers and thousands of fresh water lakes. Fishing is a popular sport. It is estimated there are almost 180,000 lakes in Finland. Many islands in the Baltic Sea belong to Finland, too. Thousands of islands are part of the Åland archipelago. Tourists from all over the world come to see the fells and the northern lights in Lapland. The highest mountain of Finland is Halti, which is 1328 meters high. The largest lake is Saimaa, 4,400 square kilometres. The longest river of Finland is Tornionjoki. The largest river (by watershed) is Kemijoki, 552 kilometres long. The weather in Finland varies widely by season. Summer usually lasts from May to early September, and temperatures can reach up to +35 °C. Autumns are dark and rainy. Winter snow usually begins to fall in Helsinki in early December (in Lapland it can fall as early as October) and in the winter the temperature can drop to -30 °C. Winter usually lasts to mid-March, when the snow melts in Helsinki (in Lapland the snow usually doesn't melt until early May), and Spring lasts till late May. Spring can be erratic, and the weather can change from frost to sunshine within a matter of days. The famed Northern Lights are common in Lapland. People first came to Finland 10,000 years ago. That was just after an ice age, after a glacier that covered the ground had receded. Some think the first people in Finland already spoke a language similar to the Finnish language that is spoken today. It is known that an early form of the Finnish language was spoken in Finland in the Iron Age. (The Iron Age in Finland was 2,500–800 years ago). The first residents in Finland hunted animals, as "hunter-gatherers". Some people started to farm crops about 5,200 years ago. Farming slowly became more and more popular and became the major way of life until the modern age. The ancient Finns were pagans. The most important god of the Finnish pantheon was Ukko. He was a god of sky and thunder, much like Odin, another Scandinavian god-king. These powers were common among the pagan god kings in pantheons ranging from the Finnish Ukko, to the Scandinavian/Germanic/Saxon Odin, all the way east to Zeus of the Greeks and Jupiter of the Romans. Around a thousand years ago, when most of Europe was adopting Christianity, Finland also began following Christianity. During the Reformation of Christianity in the 16th century, most Finns became Protestants. Some pagan practices still remain amongst the now Christian Finns, such as bear worship. From the Middle Ages Finland was a part of Sweden. Then, in the year 1809, Russia took Finland from Sweden. Finland was a part of Russia, but after a short period of time it became autonomous. The Finns essentially controlled Finland, though the Tsar was in control officially. Finns could create their own laws and had their own currency, (called the markka), their own stamps and own customs. However, Finland did not have its own army. During the 1905 Russian Revolution, in the Grand Duchy of Finland: the Social Democrats organised the general strike of 1905 (12–19 November [O.S. 30 October – 6 November]). The Red Guards were formed. On 12 August [O.S. 30 July] 1906, Russian artillerymen and military engineers rose to rebellion in the fortress of Sveaborg (later called Suomenlinna), Helsinki. The Finnish Red Guards supported the Sveaborg Rebellion with a general strike, but the mutiny was quelled by loyal troops and ships of the Baltic Fleet within 60 hours. On 6 December 1917, Finland became independent, which meant that it no longer was a part of Russia. There was a communist revolution in Russia and after 1922 Russia was a part of the Soviet Union. There were communists in Finland too, who tried to create a revolution in Finland. This attempt at revolution caused the Finnish civil war. The communists lost the civil war, and Finland did not change its old capitalist system. Stalin, who was the leader of the Soviet Union, did not like having a capitalist country as its neighbour. Stalin wanted Finland to become a communist state and be a part of the Soviet Union. The leaders of Finland refused: they wanted to stay independent. The Soviet Union sent many troops across the eastern border of Finland to try to make Finland join them, which resulted in the Winter War. The Soviet Union eventually won, and took most of Karelia and other parts of Finland. Adolf Hitler was the dictator of Germany, and he wanted to invade the Soviet Union. Finland wanted to retrieve the areas that it had lost, so they joined the German invasion, which started with Operation Barbarossa in 1941. The Finnish part of the Second World War is called the Continuation War in Finland. However, Finland was not a fascist or an antisemitic country. Finns were interested in freedom rather than dictatorship. While Germany was losing the war, Finland had already progressed into the Soviet Union in order to regain the areas lost in the previous peace. Finland wanted to end the war with the Soviet Union, which resulted in peace. Once again Finland had to give up the areas they had conquered. This time, the peace with the Soviet Union made Finland and Germany enemies. Finns fought the Germans, and Germans retreated to Norway, burning down all of Lapland behind them. This is called the Lapland War. Finland remained independent. After the war, many factories were built in Finland. Many people moved from farms to cities. At that time, big factories manufactured products like paper and steel. More and more people worked in more advanced jobs, like high technology. Also, many people went to universities to get a good education. Finland was one of the first countries where most people had Internet connections and mobile phones. A well-known company that makes mobile phones, Nokia, is from Finland. 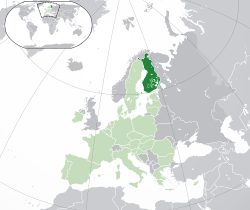 Finland joined the European Union in 1995. The Finnish currency was changed to the euro in 2002. Finland has a mixed economy. Free market controls most of production and sales of goods, but public sector is involved in services. In 2013, taxes were 44% of gross national product. This is 4th largest in Europe, after Denmark, France and Belgium. In 2014 services were 70% of the gross national product. The largest company in 2014 was oil refinery Neste Oil. The second largest was Nokia. Two forest industries Stora Enso and UPM-Kymmene, were numbers three and four. Number five was Kesko which sells everyday goods in K-supermarkets. Elections are organized to select 200 members to the Parliament of Finland. Also selected are the president of Finland, members of town and city councils and Finnish members to the European Parliament. The elections are secret and direct. People vote directly for the person they want to be elected. In presidential elections votes are only cast for a person, not for a political party. All the other elections are proportional. The system is a combination of voting for individuals and parties. The right to vote is universal and equal. In general elections everybody has one vote. ↑ Formerly a semi-presidential republic, it's now a parliamentary republic according to David Arter, First Chair of Politics at Aberdeen University, who in his "Scandinavian Politics Today" (Manchester University Press, revised 2008), quotes Jaakko Nousiainen in "From semi-presidentialism to parliamentary government" in Scandinavian Political Studies 24 (2) p95–109 as follows: "There are hardly any grounds for the epithet 'semi-presidential'." Arter's own conclusions are only slightly more nuanced: "The adoption of a new constitution on 1 March 2000 meant that Finland was no longer a case of semi-presidential government other than in the minimalist sense of a situation where a popularly elected fixed-term president exists alongside a prime minister and cabinet who are responsible to parliament (Elgie 2004: 317)". According to the Finnish Constitution, the president has no possibility to rule the government without the ministerial approval, and does not have the power to dissolve the parliament under his or her own desire. Finland is actually represented by its prime minister, and not by its president, in the Council of the Heads of State and Government of the European Union. The 2012 constitution reduced the powers of the president even further. ↑ "Finland's preliminary population figure 5,509,717 at the end of August". Tilastokeskus.fi. Statistics Finland. Retrieved 24 October 2017. ↑ "Finland's population was 5,503,297 at the turn of the year". Tilastokeskus.fi. Statistics Finland. Retrieved 17 August 2017. ↑ 4.0 4.1 4.2 4.3 "Report for Selected Countries and Subjects". IMF. 17 April 2018. Retrieved 9 May 2018. ↑ Bunikowski, Dawid (March 6, 2016). "Finland's Immigration Crisis". Gatestone Institute. Retrieved 27 December 2016. ↑ "Central Principles of Holding Elections". Elections website. Ministry of Justice. Retrieved 6 February 2016. Wikimedia Commons has media related to finland.